Line jelly roll pan with cooking parchment paper. In 12- or 14-inch cast iron skillet, whisk together sugar, water and vanilla paste.. Stir in peanuts. Cook over medium heat, stirring occasionally, until mixture begins to boil, about 5 minutes. Cook, stirring constantly, until liquid reduces and sugar crystallizes on peanuts. Continue to cook and stir until peanuts are crusty looking. Reduce heat to low; continue to cook and stir as sugar begins to turn to syrup and pool in bottom of skillet. Continuously stir the peanuts into the syrup as it forms. Continue to do this until peanuts are golden brown and well coated, about 15 minutes. Sprinkle peanuts with cinnamon; toss to evenly distribute. 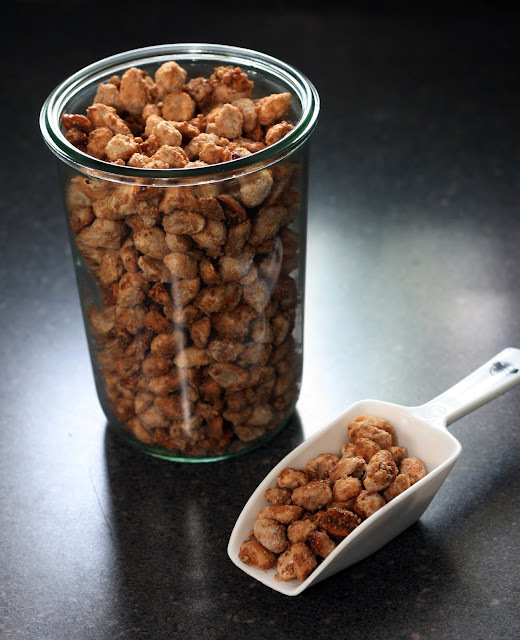 Pour peanuts into pan; spread in single layer, breaking up any large clumps. Cool completely, about 1 hour. Store in an airtight container. Food trucks might be the hot food thing of the moment thanks to a mix of low start-up costs, the downturn in the economy and reality television but there is one place that has always excelled in street food. New York City. One cannot walk a block without stumbling over some amazing food cart or bumping into one of the long lines one of the dozens of food trucks attract. You can find anything from biryani to authentic Belgian waffles to Taiwanese-style fried chicken. However, my personal favorite is the fragrant cinnamon nuts one finds on early every street corner during the winter months. At less than $3 dollars these sugared nuts are the perfect, affordable pre-theater snack or Central Park nosh. However, not living in NYC myself, I’ve had to come up with other ways to fill the void. After a few false starts, I was excited to finally figure out the secret of making these nuts at home; lots of sugar and the patience to stir, stir, stir until the perfect crunchy texture is obtained. Now I can make these whenever the mood strikes and for a fraction of the cost of a train ticket to NYC. Bonus: they make great gifts!